. : XC Ottawa Posts Excellent Results at Easterns! :: Ski XCOttawa.ca :: Skiing in Ottawa and Gatineau Park :. XC Ottawa Posts Excellent Results at Easterns! XC Ottawa enjoyed a successful weekend of racing this past Saturday and Sunday at Nakkertok, host of the 2010 Eastern Canadian Championships. As always, Nakkertok and it's volunteer crew did a phenomenal job hosting what always ends up being my favourite events of the ski season. The trails were in excellent condition and the volunteers greeted racers and ski fans with smiles. Also, giving out pottery instead of medals is hands down the greatest thing any race organizer has ever thought of. Thanks Nakkertok! 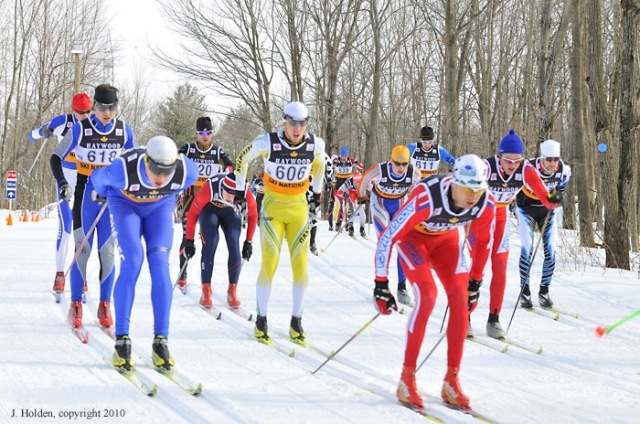 As for the racing, XC Ottawa started off strong in Saturday's individual start skate races. The day featured 5k for the women and 10k for the men on tight, twisty and rocket fast course. The women's race was won by Brooke Gosling of the Alberta World Cup Academy with Alana and Megan taking the remaining podium spots. Sheila and Anna rounded out the team results with 7th and 16th place finishes in a large senior women's field. 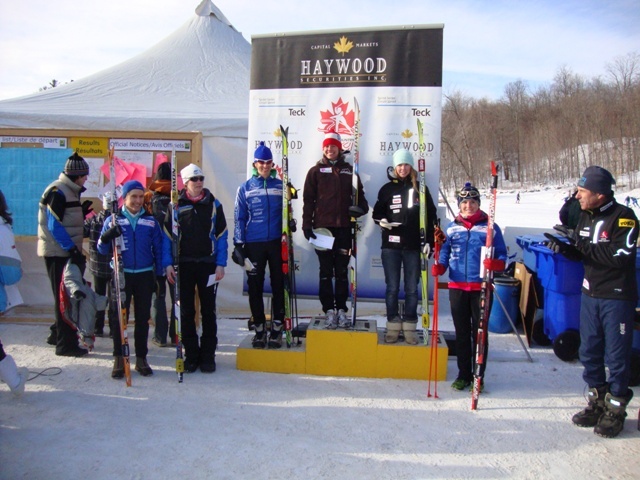 Above is a shot of the Open Women's podium for the 15k classic- Left to right: Sheila Kealey 6th, Mary Thompson 5th, Megan McTavish 3rd, Brooke Gosling 1st, Catherine Auclair 2nd and Alana Thomas 4th. On the men's side it was Karl who proved yet again to be the team's leader, posting a 4th place finish in both the 10k skate and Sunday's 30k classic. On the senior side Matthias and Justin had great races to finish 9th and 10th in the 10k skate while Colin grabbed the 10th junior spot. Above is a shot of the men toughing out the 30k classic, Karl and Matthias are the ones in the SWEET red suits. Thanks to Jo-Ann Holden for the great photo! Sunday's mass start classic races proved to be another opportunity for XC Ottawa to shine while Megan, Alana, Sheila and Anna took 3rd, 4th, 6th and 13th places in yet another big senior women's field. The men toughed out 4 laps of a really fun and challenging 7.5k course to ski a grueling 30k. Karl, Colin and Matthias showed what good classic form and endurance they have finishing 4th, 7th and 11th in the epic 30k. Above: Karl represents XC Ottawa with a cool blue jacket. Black jackets are so last year. 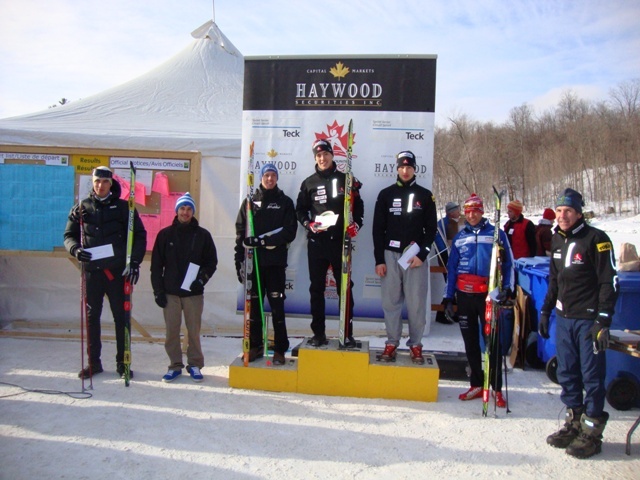 On the junior side Lee and Kyle skied strong in the 15k classic with Lee taking bronze in the university 15k. Good signs for the upcoming OUA championships! All in it was a great weekend for our team and we certainly could not have done it with out our coach John Suurronen, wax techs Craig Storey and Frank Demers and our feed team of John, Frank and Diana Deakin-Thomas. Thanks to all!